A few months back I Blogged about some of the new options in the SolidWorks Knowledge Base. Well, the folks at SolidWorks are at it again. I went to the Customer Portal last night to do a Knowledge Base search and notice MORE new options! I’m not sure how new they are but I certainly haven’t seen or heard about it yet! 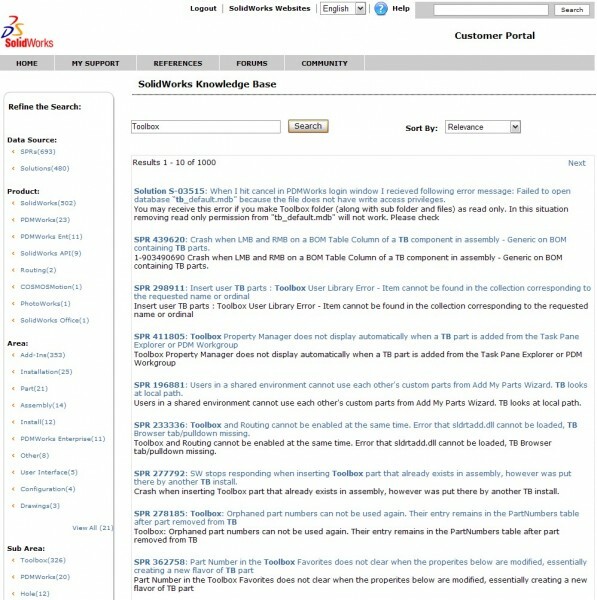 The front page for the Knowledge Base has received some attention. I’ve got to admit it was a bit plain with little description as to what it actually was previously. For the first time I have seen, it refers to the Knowledge Base as the SolidWorks “KB” ….interesting. The front page has an explanation of what types of information is included in the KB search. SPR’s (Software Performance Requests – Bugs), and Solutions which have been included in the search in the past have been joined by Service Requests (SR), SolidWorks websites, & Documentation. Below is an image of the new front page. Once you type in a keyword and hit search you’ll find some nice new options on the left side of the screen. You can refine the search results by Data Source, Product, Area, Sub Area, & Status. Note that the main Data Sources are still from SPRs and Solutions. Another VERY nice feature is the ability to sort the results “Oldest to Newest” or “Newest to Oldest”. This was already a great tool to find solutions or answers to questions quickly and it seems to be getting better and better!